Powerware 9120 (PW9120) is an Uninterruptible Power System by Eaton. 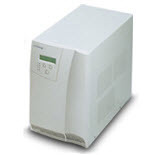 The Powerware 9120 UPS is designed for applications that require maximum protection. With its double conversion design, the 9120 provides uninterruptible clean sine wave power to the critical loads and with its advanced communication, the 9120 is the ideal solution for networks, web servers as well as industrial application protection. Powerware 9120 with its wide input voltage window is capable of working with mains power in most conditions without discharging batteries, thus saving battery capacity for when it is really needed. This unit is compatible with ConnectUPS Web/SNMP network adapters. ConnectUPS Web/SNMP network adapters are the most powerful and flexible way to manage and monitor UPSs in a computer network environment. Web interface shows current status of the UPS at a glance, while also storing data in its memory for future reference. If ConnectUPS Web/SNMP network adapter is installed in the system then you can use optional Environmental Monitoring Probe (EMP) which provides temperature and humidity sensors as well as two relay inputs which can be used to detect intrusions, water leaks, smoke and fire alarms. As a bonus, status and environmental data from the UPS unit and its Environmental Monitoring Probe can also be read by the iMCA System thereby saving you the need to invest in other environmental sensors with the same parameters as EMP. When integrated with the iMCA System, you can not only remotely monitor ambient and UPS's internal temperature/humidity but also create virtual connections with any switching and sensing devices registered in the iMCA System such as static, pulse, IR, security arm or disarm etc. You can easily create and execute any number of automation scenarios based on sensor information from this unit (including state of UPS), without having to deal with any cryptic codes or learning a scripting language. With this device together with the iMCA System you can affordably build effective Climate Control solutions and receive alert notifications via email and SMS when desired environmental thresholds are exceeded. Network connection 10/100BaseT RJ-45 (ConnectUPS-X has a built-in hub which provides 3 additional connectors for other devices). UPS Protocol Powerware UPS protocols (XCP, UPSCode II). Operating temperature: 0 – 40°C. Operating humidity: 10 – 80 %, noncondensing. Power consumption: 3.5 W maximum. Temperature measurement: 0-80°C, accuracy ±1°C. UPS Protocol: Powerware UPS protocols (XCP, UPSCode II). Power: input 12 VDC (from the ConnectUPS Web/SNMP card). Dimensions: 58 x 38 x 30 mm.